When I saw this make a wish stamp, I had to have it. 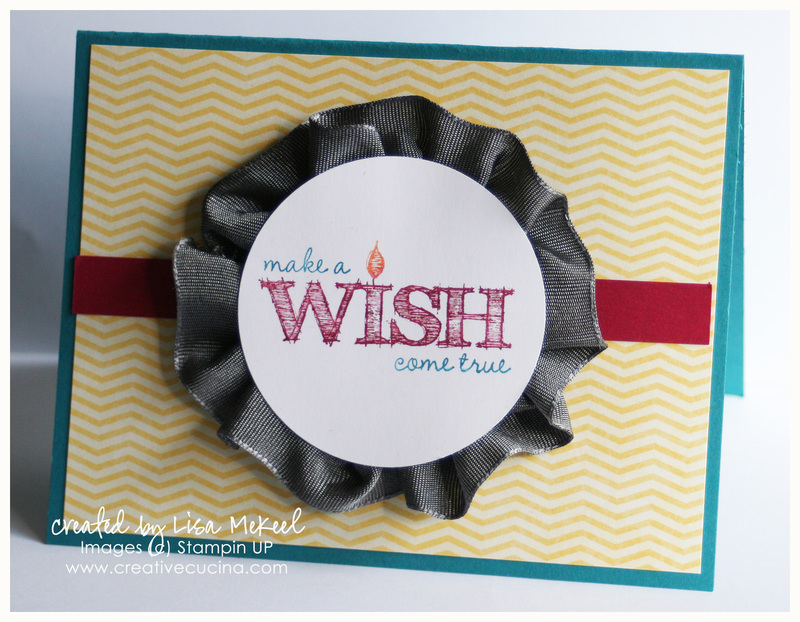 Funny enough, it’s from the Make a Wish stamp set in the Occasions Mini 2013 catalog. I like it so much I made 2 cards with it! Actually 3 cards but I gave one away already before taking a picture! First up is the card pictured above. I used markers to color different parts of the stamp different colors. I stamped it on Whisper White card stock and punched out the circle with the 2 1/2″ Circle Punch. The base is tempting turquoise, layered with chevron print paper from Rain or Shine Designer Series Paper. The strip of paper is Raspberry Ripple. For the Basic Gray/Basic Black 1 1/4″ Two-Tone Grosgrain Ribbon medallion, I used the Jumbo Sticky Rounds. Apply the Sticky Round to the back of the Whisper White circle, then take your ribbon and stick the end onto the back of the card stock. Go around the circle, pleating and folding the ribbon as you go. I added a stampin dimensional to the center and a smaller 1” Circle on the back for added stability. Then adhere the medallion to the card base. The next card I made is a smaller 3″x3″ square card. I used Basic Black card stock for the base, and another piece of the Daffodil delight chevron DSP from Rain or Shine Designer Series Paper. This time, I used White Craft ink stamped on Basic Black card stock. Then, I paper pierced around the edge and used a white gel pen to connect the dots and give it a “stitched look”. 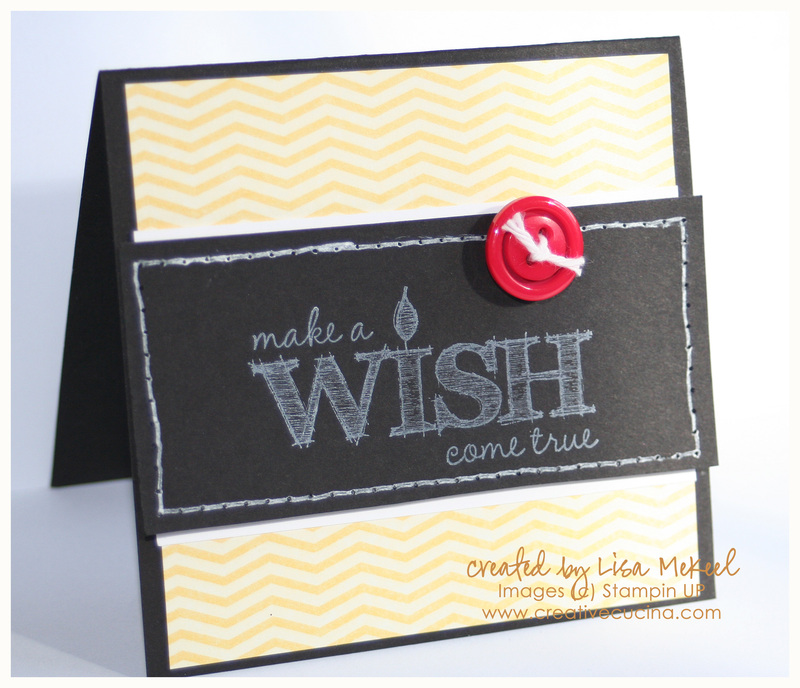 The black card stock is layered on a piece of Whisper white with stampin dimensionals. To finish off the card, I added a red button threaded with Bakers Twine. Fall is my favorite season, so it wasn’t a surprise when I fell in love with the new Spice Cake Designer Series Paper, from the Holiday Mini Catalog. The colors in the paper are Pool Party, More Mustard, Pear Pizazz, River Rock, Soft Suede, and Very Vanilla. Other than the great colors and patterns, the paper gives me an excuse to use Pool Party 3/8″ Ruffled Ribbon! 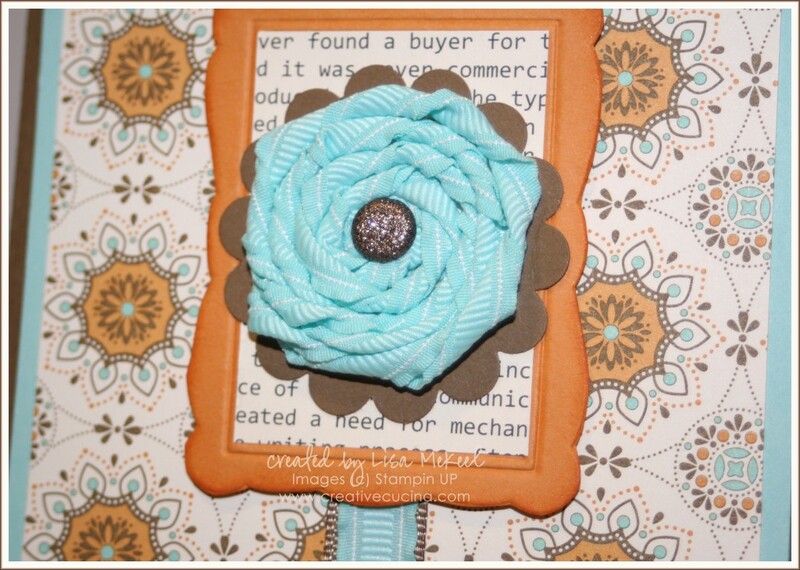 Scroll down for directions on how to make the Twisted Ribbon Medallion shown on this card. The base is Soft Suede card stock, layered with Pool Party and a layer of Spice Cake DSP. Down the front, I added Pool Party 3/8″ Ruffled Ribbon layered with 1/2″ Polka Dot Soft Suede Grosgrain (retired). In the center, I made a little frame by using the Designer Frames Textured Impressions folder in the Big Shot with More Mustard card stock. I cut the frame out and then sponged More Mustard ink around the edges to add depth. The patterned paper inside the frame is from First Edition Specialty DSP. As for the Twisted Ribbon Medallion (that’s what I’m calling it anyway), it’s very simple to make. Cover the front of your circle with Sticky Strip. Leave your ribbon on the roll and start in the center of the circle. Stick the end of your ribbon down in the middle of the card stock and start twisting the roll until your ribbon starts to twist as well. Keep twisting and spiraling the ribbon around the circle until you get all of the card stock covered. To finish, cut your ribbon off the roll, fold the end over the back of the circle, and adhere it with Sticky Strip. To add a brad in the center, use the cropadile. If your circle is too large for the cropadile to reach the center, you can use your paper piercer as well. 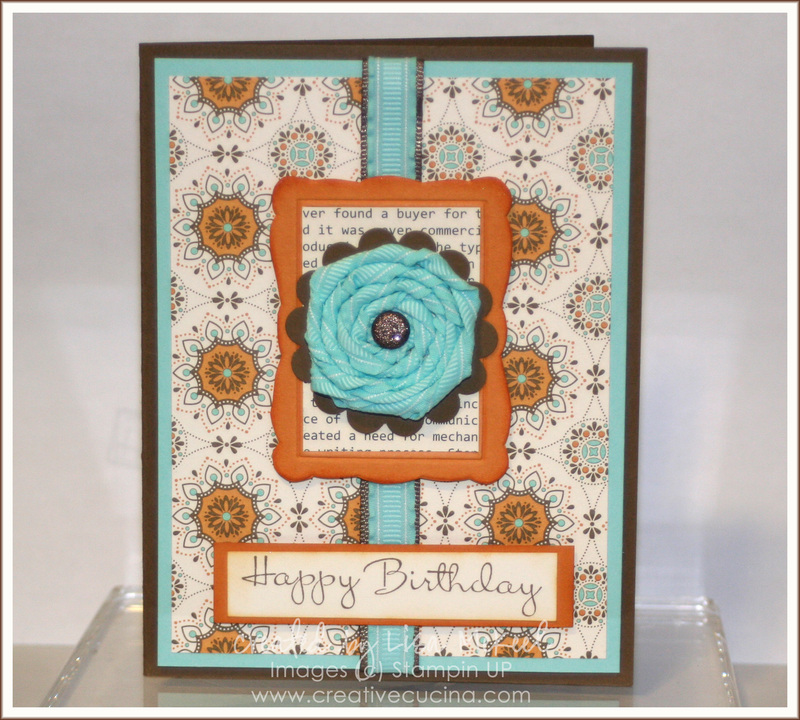 For this card, I used a gorgeous Glimmer Brad (I think this is a Soft Suede one) in the center of the medallion. Then, I layered the medallion onto a Soft Suede scallop circle made with the Scallop Circle Punch. The sentiment is from Happiest Birthday Wishes, stamped with Soft Suede ink on Very Vanilla card stock. I sponged the edges with More Mustard ink and a sponge dauber, then matted it on More Mustard card stock. It’s attached to the card with stampin dimensionals. 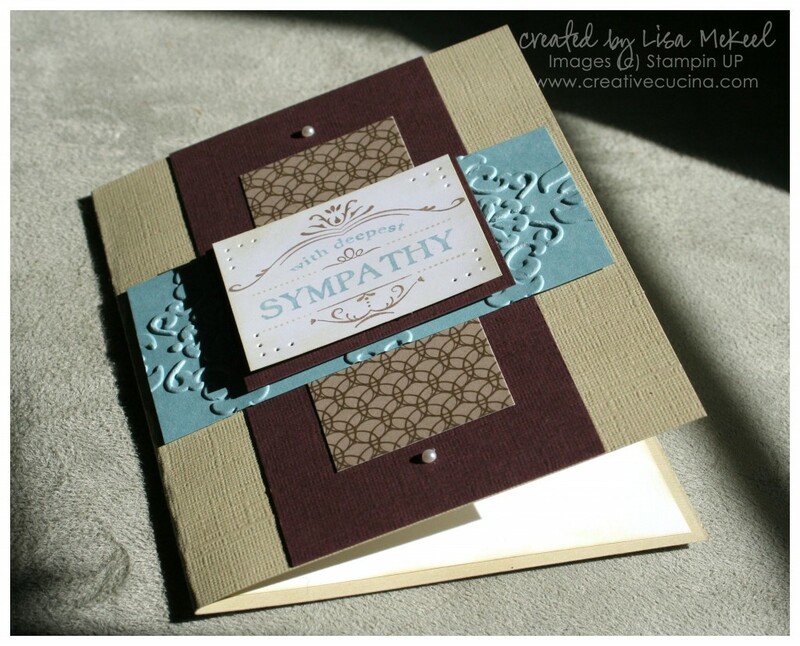 This card uses the Thanks for Caring stamp from the Occasions Mini Catalog. Unfortunately, I have needed to make a few sympathy cards lately. The base is River Rock textured card stock. 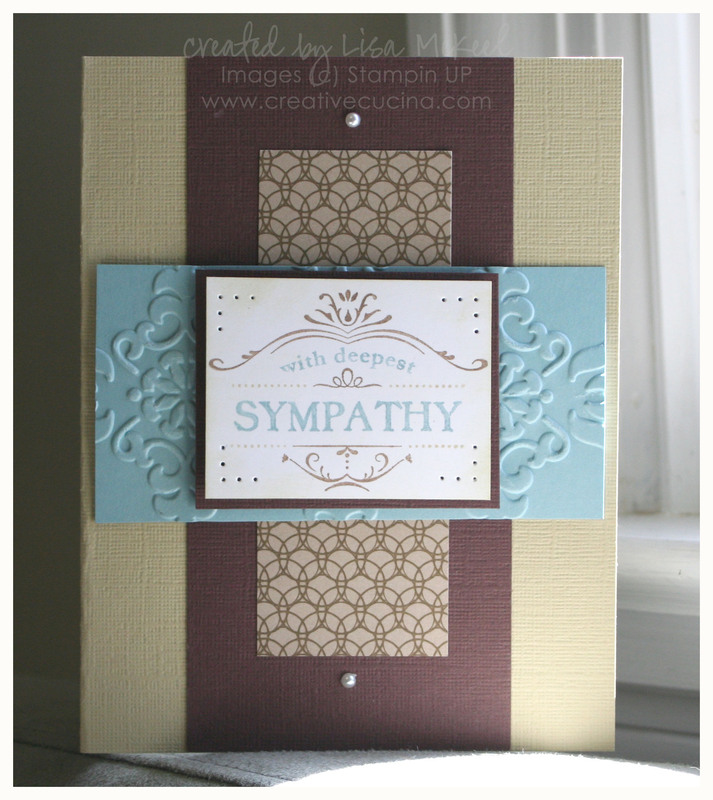 I placed a wide strip of Chocolate Chip card stock down the front, layered with a short piece of Elegant Soiree DSP. Above and below that piece, I used 2 Basic Pearls. As for the sentiment, I colored it with SU Markers: Soft Suede, Baja Breeze, and River Rock. It was stamped on Whisper White card stock on which I paper pierced the corners only. With a sponge dauber, I sponged on some River Rock ink just to soften the white a little bit. 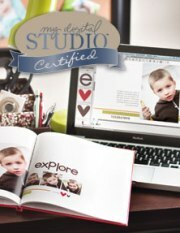 That was matted onto Chocolate Chip textured card stock with stampin dimensionals. Horizontally, I added a strip of Baja Breeze card stock, embossed with the Vintage Wallpaper Embossing Folder and the Big Shot.